I’m traveling to Pisa today and the train ride is a short one—only thirty minutes. I sit back and enjoy a relaxing breakfast at the Hotel Palazzo Alexander, knowing that there’s no need to be there just yet. I saw the Leaning Tower and the sites in and around Piazza dei Miracoli on my first trip to Italy back in 2008, and I’m not planning to go again. 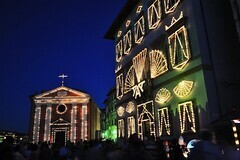 I’m visiting for a very different reason this time, to see the Luminara di San Ranieri, a festival held every June 16 in honor of the city’s patron saint, a 12th century troubadour who traded in his music for a deeper commitment to God. 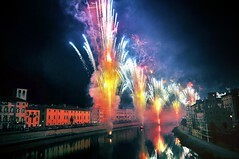 Tonight, in a tradition that dates back more than 300 years, over 100,000 candles will be lit along the banks of the Arno. Despite the inevitable crowd, I’m looking forward to it. 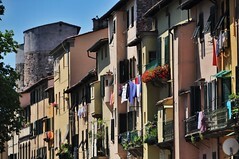 With plenty of time to get there, I decide to linger on in Lucca for nearly half the day. I visit the medieval church of San Frediano, stroll through a local flea market where I donate a few Euros to an animal shelter that has a cage full of adorable kittens, buy a hand painted Christmas ornament with the Piazza dell’Anfiteatro on it as a souvenir of my stay, and walk along the walls one last time, past the lush gardens of the Palazzo Pfanner to Porta San Gervasio and back. It’s two in the afternoon when I arrive at Pisa Centrale and phone the Hotel Bologna to arrange a ride on their free shuttle bus. By half past, I’m settling into a nice single room, with a tall ceiling and a striped bedspread in warm tones of orange, yellow, and red. Later, when I walk out to Lungarno Gamacorti with a dish of gelato in hand, there are preparations for the night’s festivities already underway up and down the banks of the Arno. There are street vendors selling balloons and candy and roasted nuts. 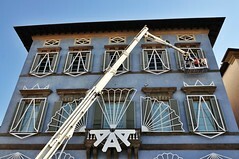 White wooden frames in decorative shapes and patterns (called linen) have been attached to the buildings along the riverbank, and there are workmen in a dozen or more boom lifts, stretched high like a giraffe’s neck, hoisting candles into place. There are also platforms in the river itself, from which fireworks will be launched at the end of the night. 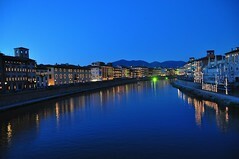 With hours to go before dark, I decide to go shopping along Corso Italia, Pisa’s equivalent of High Street. At the insistence of an old woman behind the counter at Catherine di Rofrano Patrizio, who speaks no English but communicates exceedingly well in gestures, I buy an aqua wrap dress with a low V-neck because she thinks it brings out the color of my eyes. I also pick out a simple coral sun dress from Vuerre, since it matches the Murano glass necklace I bought in Venice. As I’m in the dressing room trying it on, Avril Lavigne’s “Wish You Were Here” is playing on the store radio, and it makes me think of someone I miss, someone who’s going to like this dress very much when he sees it. What was it I said, that solo travel is a hard and lonely business sometimes? It is. I follow Corso Italia all the way down to the train station and back before stopping for a casual dinner in Piazza Chiara Gambacorti. I order a caprese salad and a plate of ravioli in a walnut cream sauce, and while neither are particularly good, the lively atmosphere more than makes up for the food. There is a flag with a Pisan cross hanging from an open window, a man on stilts walking about in red and black polka dot pants, and a cluster of balloons representing an odd mix of pop culture icons—from Smurfs and Barbies and Winnie the Poohs, to Spongebob Squarepants and Tweety Bird. I head back to the hotel for a fresh camera battery, a new storage card, and a small tripod. By the time I reach the riverbank again, the crowd has swelled and it’s growing claustrophobic. Teenagers have taken positions high on the cement embankments, so I work my way over to the Ponte Solferino, where I’m fortunate to find a prime viewing position midway across. By 9:30 PM, the sky has deepened into a rich cobalt blue and the candles on the palazzos are twinkling like a thousand strands of Christmas lights. It’s a beautiful sight, and for a moment I am tempted to walk all the way up to Piazza dei Miracoli to see the lanterns hanging on the Leaning Tower, but the thickness of the crowd makes moving virtually impossible. Eventually, I work my way down to the Ponte di Mezzo and across to the other side to get a closer view of the candles, but it’s an unnerving crawl in an increasingly boisterous mob. I’m grateful to be back in place on the Ponte Solferino by the time the fireworks start at half past eleven. It’s been a unique experience being here tonight, much like visiting London during the Queen’s Diamond Jubilee, or standing on the Rue de Rivoli in Paris for the final laps of the Tour de France. I’ve been fortunate enough to do both, but no one throws a party quite like the Italians, with the same mix of ancient tradition and unbridled joy. It says a lot about a people to watch them celebrate. I may have missed the infiorata in Spello this year, but I’m glad I made it to Pisa.